Drywall is a commonly used material in home and commercial property construction because it’s cost effective and easy to install. It’s also known as Sheetrock, wallboard, plasterboard and gypsum board. This material is often used not just for walls but for ceilings as well. These panels are lightweight and very versatile. They can be applied with a wide range of finishes and textures to achieve all sorts of desired looks. Although these sorts of panels are durable and can be fire-retardant as well, this doesn’t mean that they are not susceptible to some issues. Proper maintenance is needed in order to maintain their beauty, as well as to extend their lifespan. You should perform a regular inspection every so often to look for early signs of potential problems. By doing something to fix the issue in the early stage, you can prevent the problem from exacerbating. While serious issues should be left to drywall repair experts, there are simple issues that you can fix on your own to try and prevent major trouble later on. These are relatively minor issues that a lot of people take for granted. However, small holes and cracks could worsen if not taken care of immediately, and they can lead to bigger and worse trouble, which would cost you more to repair. Then there's the aesthetic aspect to consider. Even a small hole or crack can attract the attention of people, and - justifiably or not - it will give them an impression of your home, and probably of you as a person. 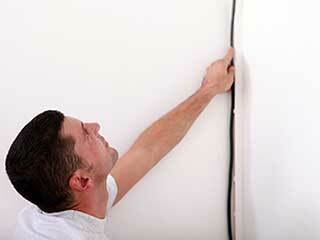 If you want to keep your walls looking great, then these minor damages must be fixed as soon as possible. Spackling paste can be used to patch small holes and cracks. These pastes have different weight. Use a lighter one for small nail hole and cracks, as heavier varieties will be more difficult to apply onto superficial damages. Stains and dirt could blemish your drywall panels and completely ruin their visual appeal. Repainting the affected panels can bring back the old beauty of the wall or ceiling in question and even spruce up the look of the room. Remember to clean the surface and apply a primer first to make sure that the paint would stick properly. This is another common concern. Drywall studs and ceiling joints can pop out and not only ruin the aesthetic of the surface but create a bump that can catch strings and fabric on it too. You'll need to remove the popped nails from the plasterboard and replace them with new ones, then seal them with joint compound to smooth out the area. The previously mentioned issues are just some of the simple things that you can take care of by yourself to prevent them from becoming worse. However, bigger problems like water damage and mold growth must be left to the experts. Moreover, if you’re not confident about fixing the smaller issues yourself, it’s also best to leave them to our professionals, to avoid causing more damage. Our team at Drywall Repair & Remodeling Canyon Country are always happy to help.